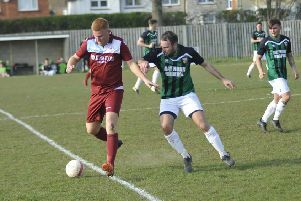 The victorious Hastings United team against Ashford United on Saturday is thought to be one of the youngest the football club has ever fielded. Eight of the starting XI were 20 or under and with goalkeeper Charlie Horlock the third-oldest at 22, the average age was just 20.9. A brilliant hat-trick from 19-year-old Calum Davies gave Hastings a 3-1 victory. Davies was only the fifth-youngest player in the starting line-up because Adam Lovatt, Tom Climpson, Davide Rodari and Ansu Janneh are all 18. The full list of ages is as follows - Goalkeeper: Charlie Horlock 22. Defenders: Ollie Rowe 26, Rhys Whyborne 31, Tom Climpson 18, Ollie Black 20. Midfielders: Dayshonne Golding 20, Adam Lovatt 18, Davide Rodari 18, Ansu Janneh 18, Sam Cruttwell 20. Subs: Kenny Pogue 30, Sam Adams 30, Adebola Sotoyinbo 21, Tyler Scrafton 19, George Taggart 18.